India Electric Insulators Market size was valued over USD 300 million in 2017 and is set to expand over 7% by 2024. Increasing investments toward the modernization of aging grid infrastructure along with rapid urbanization will drive the India electric insulators market. Rising investments for the expansion of electric networks along with investment targets supporting the complete value chain of power transmission, generation, and distribution will further propel the industry dynamics. For instance, the Department of Heavy Industries (DHI) developed a 10-year mission plan in 2012 for the future developments of the domestic electrical equipment industry. Surging electricity demand for the steeply growing population along with investments to promote rural electrification programs will boost the India electric insulators market. Ongoing shift toward generation of electricity from cost-competitive renewable energy sources will further complement the industry landscape. In 2015, the Government of India introduced the Green Energy Corridor Project, offering an investment worth USD 1 billion toward the development of a separate grid infrastructure for renewable energy transmissions. Rising need to provide electricity to areas that lack grid infrastructure along with the need for network expansion will stimulate the industry growth. Investments by regulators at national & state levels to increase the availability of electricity will further fuel the business landscape. The Government of India is focusing on attaining ‘Power for All’ to accelerate capacity addition in the country. 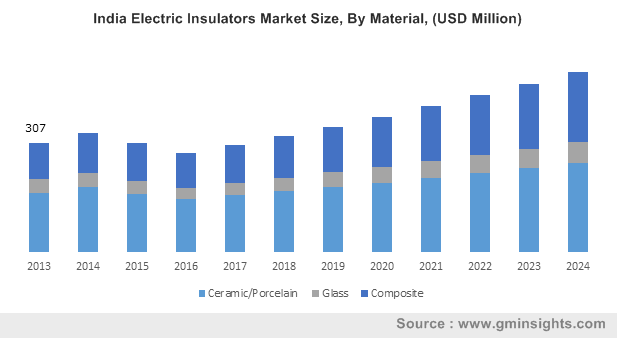 Rising need to overcome transmission breakdown along with the need to mitigate environmental pollution will boost the composite electric insulators market. Low weight, excellent hydrophobic surface property, low surface energy, and higher mechanical strength are some of the key features that will boost the product adoption. High-voltage electric insulators will grow on account of their widespread deployment across various types of transmission infrastructures. Increasing development of high-capacity transmission networks to carry electrical signals over long distance will further stimulate the product demand. 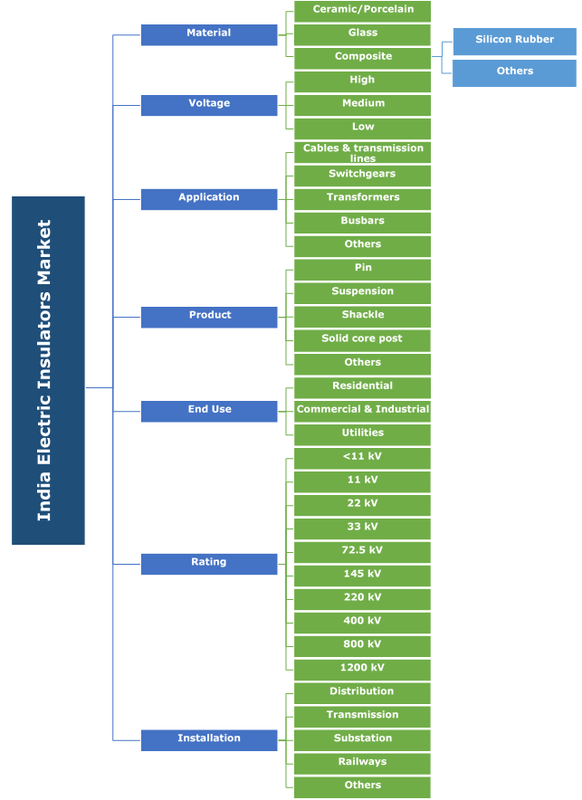 Developments made by manufacturers to upgrade the technical and physical features will act as a major strategic component to compete in the HV electric insulators industry. India transformers electric insulators market will witness growth on account of escalating electric infrastructure spending coupled the ongoing industrial expansions being carried out in the country. Increasing investments made by government authorities for the reduction of transmission losses will further complement the industry growth. Shackle insulators is anticipated to expand over 8% by 2024. Extensive applicability of these insulators in low-voltage distribution lines will propel the business landscape. These insulators are also used at sharp turns, where there is an extreme tensile load on the lines. Ability of these insulators to meet the electricity demand in a cost-effective manner along with even distribution of the load to reduce the possibility of breakage will further enhance the industry outlook. Ongoing retrofitting of the existing networks along with growing investments to enhance electricity generation will boost the utilities electric insulators market. Increasing emphasis on the integration of wide-ranging frequency transmission links along with initiatives for electrification programs will further stimulate the product demand. 33 kV insulators will witness growth owing to their widespread application across the power and infrastructure sectors. Ongoing establishments of electrical networks across residential areas coupled with the expansion of micro-grid networks will positively impact the business landscape. India transmission electric insulators market is anticipated to grow over 7.5% by 2024. Subsequent upgrading of power transmission networks for optimized energy consumption coupled with investment to ensure effective grid infrastructure will further boost the industry landscape. Notable industry players across the industry comprise of Aditya Birla Nuvo Ltd., Olectra Greentech, Modern Insulators, Deccan Enterprises, Spark Insulators and BHEL amongst others. Established supply network, cost competitiveness and product accreditations are among the significant strategic assets that manufacturers pursue to gain a strong foothold in the industry. Electric insulators are materials whose electric charges cannot flow freely under the influence of an electric current. They are used to support and separate electric conductors without allowing current to pass through them. The insulators find applications in the electrical network to provide mechanical and electrical support and are designed on the basis of pollution level by taking the shed angle and shed profile into consideration.